Today I have the pleasure and honour to interview one of the most interesting names among the youngsters of the tour, Slovenian young talent Ula Hafner. -So Ula, let's introduce yourself first, they know your name already, which is a start, but when and where were you born? -Describe yourself in 6 words, 3 qualities and 3 flaws. As qualities I would say that I'm a hard worker, easy going and positive person who likes to talk a lot. As for flaws, well I can be so damn stubborn even in situations when it would be better not to be, as 2nd flaw I would say I'm really grumpy when I'm tired or nervous and my 3rd flaw is that I hate fast changes, it makes me totally confused and lost so let's say that fast adjustability is not my second name. -When did you start skiing? When I was 3 years old I say to my mum and dad:'' I want to be a skier!'' and since then I'm skiing but with skiing in local ski club SK Alpetour Škofja Loka I started when I was 5. -Did you have an hero you tried to emulate when you first started skiing? Do you still have a hero or at least a favourite skier? Yes I had, when I was little I was a big fan of Janica Kostelić and Bode Miller and I was telling everyone around me that one day I would be as good as them. Now I don't have any hero and when anyone asks me about favourite skier I always say that there is no bad skier in world cup and it's hard to decide who is my favourite. Nonetheless I must say in last season Mikaela Shiffrin totally impressed me so maybe I should say that she's my new hero. -Did you use to practice any other sport before dedicating yourself to skiing? Do you still enjoy them nowadays on your free time? Sure, 1st I've been dancing then swimming it was pretty much serious and in between I was trying myself in all other sports, but it was more for fun ,professionally I continued just with skiing. And yes of course, when skiing season is over I start with running ,swimming ,surfing ,cliff jumping ,tennis ,climbing and all other sports. 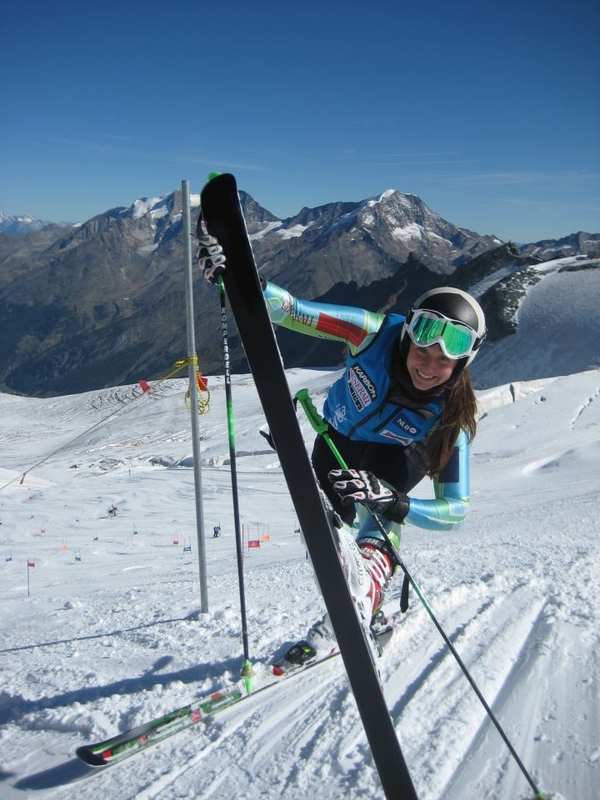 -Going back to skiing, what is your happiest memory related to the world of ski races? And what was your biggest disappointment? My happiest memory is surely my first win on Topolino race, when I was still racing in children categories because even if I knew that I was not a bad skier, I've never thought that I could really win such a big race and I was totally surprised when I won it... so it's really my favourite memory even if I always like to look back and remember all my children categories' races. Biggest disappointment...hmm...I'll say my wjc (World Junior Championships) in Les Houches and Les Planards- France it was my 2nd year of racing in FIS (season 2009-2010). I expected way too much from those races and then my gs race was a disaster full of mistakes and my slalom shape was good before World junior championship so we were all dreaming about top 10 and after a good 1st run I didn't finish my 2nd run so we were all totally disappointed. -You've had one of the most impressive first season on FIS circuit, but since then you seem to be floating around that level without any great improvement. This is a very common scenario in women skiing, what do you think is the reason in your case? Do you think it's the same for the other cases too? You are so right when you say that after first year of my racing in FIS I'm just floating around without any really great improvement. It is hard to say what is the main reason, but truth is that in my1st year of racing in fis I was training with my club, later they put me in women C team and then B team and it was pretty much different because when I came in team there were no money left for alpine skiing in Slovenia and staff was always trying to find good cheap training and, as we all know, it's not always the best so I lost myself a little bit maybe. Before I was always used to do not really much days on snow, but days I had were always efficient, hard and sometimes more difficult than trainings I had with team, so maybe that's one of the reasons, but like I said it's hard to say what went wrong. So if it's hard for myself, I guess it's harder to say for all the others. -Your first race of this season was in Levi for the Ski WC and you were close to qualify, but since then things didn't exactly go well. How do you think you'll make this season turn to the best? Levi world cup race, especially upper part of it, was great for me, but afterwards I honestly expected much more from ec races before new year, because on trainings I was still fast but on races I wanted too much and I was doing too many mistakes. At the end of December I decided to take more than 10 days off, put my head on "off" and now I'm back on snow and I'll continue step by step -first I will go on FIS races then back on EC and try to prepare myself as good as possible for WJC and the rest of season. -Being an athlet is a matter of goals, what are yours and how do you set them? My goals at the start of the season were really high, something like: EC top 15 in slalom and GS constantly whole season-long, then WJC top 10 gs + sl and some placements in WC top 30 in slalom or GS, but I like to say that when I'm without goals and I think just on good runs I'm the best, so goals for the rest of season are : do my really best and show best run I can show in given moment. -Skiing is an individual sport, but having a good team to train with is very important for one's development, do you agree on that? Of course I agree on that! When you have a good team and especially a good staff who knows how to find good training and good conditions, it's much easier to succeed. -It's generally believed that girls are a lot meaner to each other, even inside the same team, when it comes to individual sports. Have you ever experienced somethings alike? Do you think it's hard to make good friends in the circuit? Well on my luck I didn't have such an experience yet -we are all good friends in team ,but honestly I always make good friends with men easier than with girls, maybe thats's because when I was little I was all the time training with boys and playing games with boys, somehow we could say that eversince I have had more men then women friends :) But I think it is not that hard, you can be good friends with another girl, but just until the race begins on race day, we are all fighting for the same goal after all -to win and there is no friends in that game. -Being a professional athlete means training all year long, for skiers it is -if possible- even harder as you have often to take long journeys to train or race, how do you cope with studies? Yes, you are right it's far away from being easy and when it comes to school I can say that normally I have just 2 months time to do everything for my school, but at the same time dry-land trainings starts so it's really difficult, still not impossible. I am still in high school which I should have ended last year but because of skiing I risked and so I am one school year behind my school mates. -Since you are often travelling around the world, what is the thing you miss the most when away from home? There is more then one thing I miss when I'm travelling around, but let say that i miss the most my bed ,mum and her food, my boyfriend and my dog. -Anything else you want to say to your fans and our readers? I would like to say to all my fans and readers thank you a lot for all the support and keep on following alpine ski racing and other sports! It's been a great pleasure for me, I wish you all the best for the new year and your career!